In exchange for staying with a family, the artist would gift his or her hosts with a work of art. The only expense would be a “modest administrative fee for reproductions and paperwork,” says Feroleto. And during their visit the artists would create work that Feroleto would exhibit at her gallery before their departure. She’s thinking of staging a group show of all the participating artists, as well as creating social occasions for them to mingle with each other. And Feroleto does know a lot of galleries. She curated dozens of shows and organized many events during her years living in Manhattan, and is the founder of Art Walk New York, an annual charity event for the city’s homeless. Though born in Burlington while her father attended the University of Vermont Medical School, Feroleto grew up in Connecticut. She graduated from the College of New Rochelle in fine arts and obtained a master’s in lithography at SUNY Albany. Despite these arty degrees, Feroleto worked as a hospital administrator in New York. Eventually, she realized her organizing skills could be applied to the arts. And critters. A lifelong animal-rights activist, Feroleto recalls writing her first letter to the editor in the eighth grade. “I said people should not buy baby chicks and ducks for their children for Easter,” she says. “I’m a very big letter writer.” Recently that passion has been turned into a book project. With illustrator Erica Harris, Feroleto has the first of a planned series of children’s books, titled The Furry Feroletos, in process. The theme: real-life animal rescues. 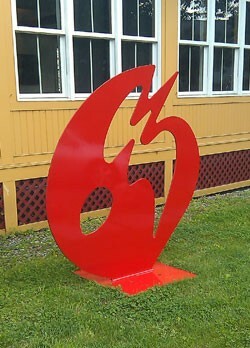 A bright-red metal sculpture by Blitt already adorns the lawn at the Green + Blue Gallery — a name chosen simply because Vermont has so much, well, green and blue, Feroleto explains. Though she returned to Vermont four years ago, the gallery materialized just last month. So far, Feroleto is showing a variety of contemporary works by artists from around the world, a mix she expects to evolve over time. One thing’s certain: Feroleto is not lacking for ideas.